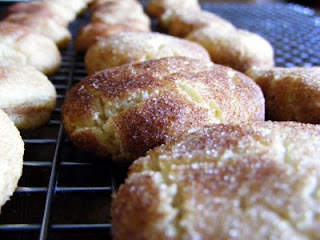 This is one our favorite cookies, of course we throw no stones at any homemade cookie fresh out of the oven. Know what I mean?? Ransome has a recital tomorrow and the mothers always bring something to nosh on so this is what Sean is bringing. Raine is not so into music as her brother so we stay behind so all can enjoy. Cream in your Kitchen Aid or with your mixer in a bowl the following, shortening, sugar, salt, vanilla, and eggs. Beat until light and fluffy, now add your flour and baking powder(I sift these two together first) and mix until well blended. Roll into 1 inch balls and then drop into sugar and cinnamon mixture and roll around until well coated. Place on a parchemnt lined cookie sheet and bake at 350' for 10 minutes. You want golden cookies, they will still be soft but the bottoms will be crispy. These are so good with milk or coffee.